ochazuke is rice, tea and a lot of very Japanese stuff. 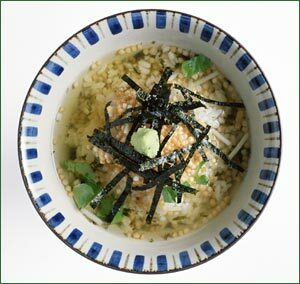 Ochazuke combines two quintessentially Japanese ingredients, plain white rice and green tea. Ochazuke is commonly served at the very end of an elaborate Japanese full course meal. It's also favored as a midnight snack, a hangover cure, or just when you want something hot and filling. It's commonly made with leftover rice, though ideally the rice should be heated up if it's cold. The stuff that goes on top makes it flavorful. Nowadays most people use ready-made ochazuke packets, from companies like Yamamotoyama. These come in flavors such as pickled plum, salmon, wasabi and sea urchin. If you can't get a hold of such packets, here is a recipe of sorts. It's basically about rice, tea and "stuff" on top. Despite the fact that this is a make-in-a-minute kind of thing, the very Japanese-ness of the "stuff" that goes on top makes authentic ochazuke a rather difficult dish to assemble outside of Japan, unless you have a Japanese food store nearby. 3/4 cup of rice. If it's cold, heat it up a bit in the microwave. Hot green tea - I like to use ho-ji cha (roasted green tea), but any unflavored and not too strong green tea will do. Genmai-cha, which has toasted brown rice in it, or hatomugi-cha, tea with another toasted grain called Job's tears, would also work. Toppings: basic ones are arare, tiny rice cracker pellets or crumbled rice crackers of another sort, and shredded nori seaweed. Optional: wasabi, pickled plum, salted salmon bits, mitsuba (a kind of herb), tiny semidried fish called jako, bonito flakes. Put the rice in a bowl, Put on the toppings, and add a bit of salt to taste. Pour over hot green tea. Submitted by maki on 2004-01-07 04:38. I just discovered your writing about food site. Exquisite. I agree with your comment on Julia Child's The Way To Cook book. As a person with little technical knowledge (so far) about how to creatively design a blog, your site makes me want to learn. Please come visit my piney woods northwest Florida site when you have a moment. Please excuse me. Maggie's paw hit the enter button when and resent my post. She was trying to get a bite of my dark chocolate. She's a chocolate lab and doesn't buy my insistence that chocolate is not a healthful food choice for dogs. The ultimate comfort food! Thanks for providing that recipe-- I'll have to try it sometime. btw, I haven't yet been to Morimoto (a few blocks away from me! ), but my dad tells me that it's quite a sensory experience. I hope to try it soon! My best friend's Father used to be Morimoto's right hand man. The few times I have been to Morimoto's, the food has been amazing. Nothing was very traditional, but some dishes were very unique such as Tuna Pizzas(highly Recommended). Can brown rice be used instead? It's up to you, I tried it the other day and since I like brown rice very much, it was still good. I love ochazuke! I grew up eating it, and we always had those ready-made packets that come in the striped packages (red and yellow and green and black stripes, I think). YUM. Love your blog. With the ochazuke packets, you just put some warm cooked rice in a bowl (about 1 cup), empty out the contents of the package on top, pour in some boiling water, stir and enjoy! Zelnox, brown rice works fine for ochazuke. i love ochazuke!! when i am sick, it is still the only food that makes me feel better. and when i have had a 'not so good day' it makes me feel like my obaasan is hugging me. i grew up calling it cha-cha rice. i never knew you could make it from scratch - i am also accustomed to the the little ready-made packets. i have tried to entice my kids w/ hello kitty and pokemon - i think it needs to be prepared with more love and less marketing. I've seen this on Iron Chef, and finally had some at one of the Japanese restaurants in Mountain View. Yummy. I'll have to try the ready-made packets. Hmmm, this went wrong for me, perhaps I did the rice wrong tough I couldn't find a pan with a tight fitting lid and the bottom of the pan hyad rice burnt on, it was strange cause the rice stuck together until the tea went on it, did I perhaps make my tea too hot? sounds yummy! =9 but I have a question, you put the rice in the bowl then pour the tea over it, right? I learned about O chazuke in Yokohama in the late 60s. I was teaching English in a Japanese school. After enjoying most everything available, O Den, Katsu don, nigiri and such, I was introduced to O Chazuke. I loved it, especially with smoked Salmon, nori, and white pepper. Genmai cha was my favorite tea. I, unlike some of the other posters, was not aware the packets even existed. I'll give it a try. I might add for other Gai jin, short grain rice is the way to go for asian food. I might add for other Gai jin, short grain rice is the way to go for asian food. Have you tried ordering proper Japanese rice online? japancentre.com is a really useful site. No other rice tastes as good as Japanese rice, or has the right texture. Accept no substitutes! I really shouldn't be looking at this site so late at night. Makes me so hungry! I've been eating Ochazuke ever since I was a child (out of those aforementioned black, red, green and yellow packets), with Japanese rice. It's good to see your blog on it. I like it best with Ame, so if you haven't tried it that way - I advise you do so. My wife, Hanako, used to have Ochazuke if she had a cold or just felt bad. Cooked rice in hot green tea with a pickled plum or two on top. the greatest thing about it is it is fun and easy to prep ingredients, set on the table and let folks create their own experience. i have a friend who does it with avacado. I combine the best of ochazuke and wild alaska salmon. It is the best at any time. I love this dish! Since stores in my area are somewhat limited in Japanese ingredients, I eat it without any toppings. And until recently we didn't have Japanese styled rice, but it tastes great with Jasmine rice! So if there's anyone who bought Jasmine rice in hopes of making soggy onigiri out if it, use it for this instead! I had this for dinner tonight! Thank you for posting this recipe! I'm a rather young (20) American girl living in Texas with very limited access to food of Japanese origin. I made this recipe today using Nishiki rice with some coarse salt, black sesame seeds and mushrooms fried in some soy sauce and it came out great (except I should have cooked the rice longer). I was a little skeptical at first, but it is sooooo yummy! I like this idea. Heard something about rice and tea, but I haven't try it, yet. Usually when I need something hot and liquid on a quick note, I just microwave vegetables, take some miso paste, which, of course, I stir together with hot water, and I have a soup. I usually also add rice or noddles, and actually, all kind of leftovers work great too (like small bits of meat, beans,...)- as in this case. And the fry rice version. Interesting. But, yeah. Will have to try this version - will replace miso with tea and see what will come out. Thank you for sharing. Ochazuke is my go-to comfort food. It is enjoyable even without any toppings, just rice and Genmai-cha with soy suace-covered cubed tofu on the side as well as a side of tsukemono if you can get it/are up to making it (or, if you're not vegetarian, with sliced bologna in the bowl). I love the tiny round arare but after once finding it in its own package at a JasMart in Manhattan, I have not been able to find them sold alone in any Japanese markets in NY, NJ, or LA or when I was in Hoya area of Tokyo. My Japanese friends do not seem to be aware that they could be bought alone. I can only find them in a pre-packaged mix with other flavoring I don't want and I have to buy one of those and handpick out the arare. Is there an online store that carries tiny arare by itself? I don't know of any specific online seller that carries it (except in Japan) but the name for the tiny arare is "bubu arare". Maybe you can get a friend in Japan to get some for you. It shouldn't be too heavy/expensive to ship. Ochazuke is great. -- we have it with cooked salmon, nori and a bit of cayenne pepper-- great for a delicious light supper. When I last visited Japan, I would have it for breakfast as well. Re: Ochazuke, rice with tea, but not Gunpowder? Hello! THank you for the wonderful recipe, but I'm curious, why not gunpowder tea? Gunpowder is a green tea, its just been rolled into pellets that help protect the leaf's shape and taste. Some higher end types of teas such as Jasmine come rolled into pellets! My grandmother was full Japanese.She often made me rice and tea with calrose rice and black tea as a child and I have always eaten it that way. I never thought to use Green tea and I still haven't. I wonder why she substituted black tea. I will give it a shot with green tea, but if you havent tried it with black tea, please do! I top it with this stuff that I've always called Tokyo-zuke, and it's canned pickled roots and herbs and veggies. I think it contains swordbeans, bamboo, and eggplant along with various other things. LOL I'm not completely aware of what it contains but it's good anyway. You can get it at most Japanese markets and it's on a green and gold can. The pickled vegetables are called fukujinsuke. I seem to recall it as Tokyo-zuke also or something very close to that - maybe that was a brand name of the the pickles. I also like to have my chasuke with takuan which is a yellow pickled radish. You say "any green tea will do" and then you say "not gunpowder tea". Why? Gunpowder tea is just green tea leaves rolled into balls. Are you putting the leaves in too, and worried that the unfolded leaves be too big for this dish? So gunpowder isn't appropriate because Chinese greens taste drastically different from Japanese greens due to the drying process. In essence, Chinese greens are too light for a dish like this because they are dried differently. Japanese greens tend to be very strong, with a heavy seaweed or umami flavor, almost like a seaweed broth, and Chinese greens are light and astringent. (There are some exceptions to this but gunpowder isn't one of them.) So one is more appropriate to stand in as a broth substitute. just hear about this food from my Japanese friend..wonder how it taste..i will try this..